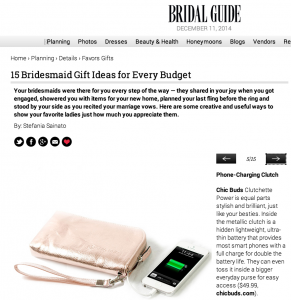 Congratulations to our Client Chic Buds for their feature on Bridal Guide! Chic BudsÂ Clutchette Power is equal parts stylish and brilliant, just like your besties. Inside the metallic clutch is a hidden lightweight, ultra-thin battery that provides most smart phones with a full charge for double the battery life. They can even toss it inside a bigger everyday purse for easy access. It’s a great gift to show your bridesmaids how much they mean to you! Check out other stylish tech gifts at chicbuds.com including Earbuds, iPhone Cases, Portable Speakers and Power Phone Charges. Making life and audio a prettier place!